The “multilinguality” of Web content provides opportunities for users to directly access and use previously incomprehensible sources of Web information. Monolingual search engines only allow users to enter a search query in one language. This restriction clearly limits the amount and type of information that an individual user can access. In a global community, users are looking for online information access systems or services that can help them find and use information presented in native or non–native languages. A Cross–Language Search Engine enables web users to access information that could not be accessible before. By performing a cross-language search, users just need to write the query in their native language, then just select the target language for the SERP (Search Engine Results Page) and get the result. Practical example of Cross-Language search? I will tell you my personal experience. I needed a solution for a problem with my smartphone concerning a terrible battery draining. I searched on Google in my language but didn't find anything helpful. By using a Cross-Language Search Engine, I found that a blogger somewhere in Poland had already a solution to my problem but his post was written in a language I didn’t know. So, I just "machine-translated" his post to understand the gist of the content. I realised then that it was exactly what I was looking for, and I asked a polish coleague to translate for me the whole content. 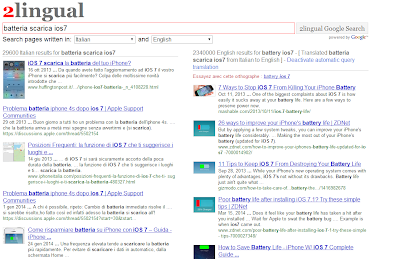 If you want to try a Cross-Language Search Engine, try 2lingual. 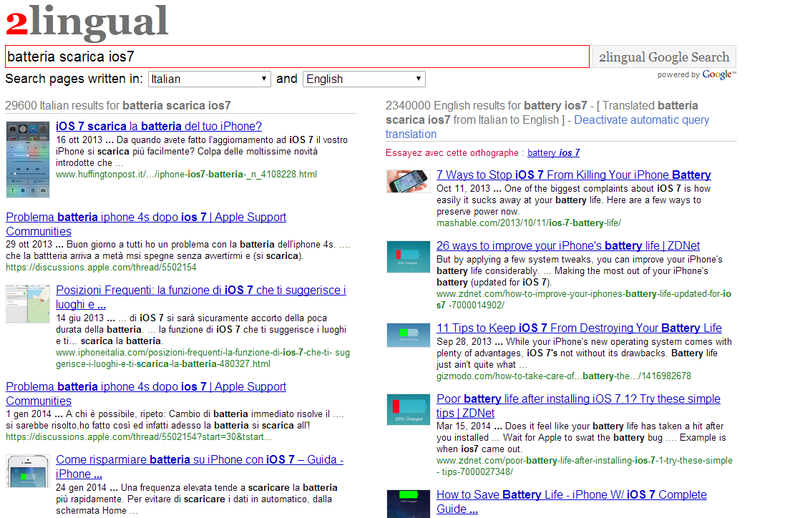 2lingual is a useful dual-language search tool that makes it easy to search in 2 separate languages. It performs both a Google Search and a Google Cross-language Search. It also provides a query translation option that can be activated or deactivated for Cross-language Google Searches. The top-ranking Google Search Results from 2 different languages are presented side-by-side in separate lists. Currently, 37 Google Search Languages are supported. If you like this topic and want to learn more, I suggest you to read the Multilingual Knowledge Blog.